There are two bedrooms for guests – a double and a twin. The twin has a basin in it. 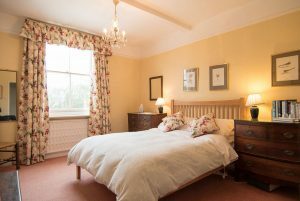 Both bedrooms face south-east (over the garden) – so they are not overlooked by anyone, and any passing traffic is virtually inaudible, even with the window open. Both rooms are easily big enough to add an extra single bed if necessary. And we do have a travel cot available for very young guests. 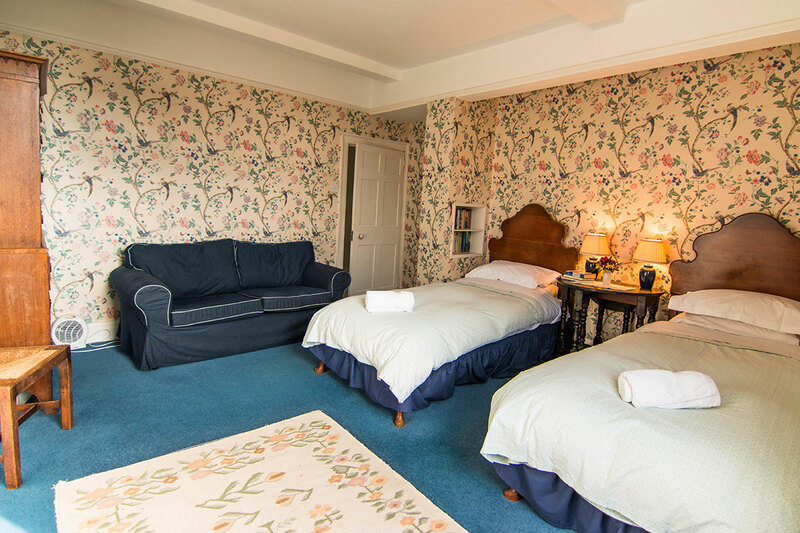 Next to the double room is the guests’ bathroom – which you will have to share with the people in the other room (if any), but not with us. The bathroom is large and rather splendid, with a big old-fashioned cast-iron roll-top bath. Our guests usually seem to enjoy our bathroom rather more than the ‘en-suite’ arrangements elsewhere which so often are just a rather smelly shower-room in their bedroom cupboard! In this house, we are ‘off-suite’ – and proud of it! You may not know but your host is a wine merchant. If you are looking for a different and perhaps more individual wine than you can normally find in the big multiples, please ask to see my list.